Childbirth is a family experience! Most women are seen for their first prenatal appointment sometime between 7 and 12 weeks of pregnancy. Your first appointment lasts two hours and covers various aspects of your history, your current pregnancy and a regular prenatal exam. weekly until you have your baby. Midwives provide maternity care based on the ideals of: protecting physiologically normal, non-medical pregnancy and birth. I provide continuity of care- meaning you’ll get to develop a relationship with your birth team and know who “catches” your baby. Informed choice- meaning that you are the primary decision maker in your care. Your team will provide you with the information pertaining to choices you will make throughout your care. If the above ideals are things you would like to incorporate into your pregnancy/birthing experience, and you are a healthy pregnant woman, midwifery care may be for you! If at any point in time your pregnancy or birth becomes a medical event, you will be referred to a hospital and/or physician that will provide you with medical care as needed. We are not anti-medical and are grateful for our local physicians and hospitals in the event that normal physiological birth becomes something different! Home birth is not for everyone. We acknowledge that certain pre-existing medical history and/or developments during your pregnancy may influence or hinder you from being a good candidate for home birth. We ALWAYS put you and your family first, and will guide you with alternative arrangements if home birth is not your safest option. If this should happen, we are happy to remain part of your support team during your hospital birth. During early labor, we try to touch base and stay in contact because we like to arrive before the onset of active labor. We provide physical and emotional support. Mom is encouraged to move, eat, drink and sleep until active labor begins. At the onset of active labor, we monitor the flow of the labor and the well-being of mom and baby. Family members are also encouraged to provide support for the mother. We encourage mothers to move about freely, while we assist with breathing and coping skills. Midwives respect your wishes during your birth and provide a protected space of privacy and safety. Freedom to give birth the way you need to. Water birth and/or birth pool rental are available. Eco brand "Birth Pool In A Box" is available to be rented. Your personal pool liner is purchased separately along with your home birth kit. We encourage bonding and privacy for the family. The baby is placed upon mother's abdomen or chest, kept skin to skin, warm and dry. 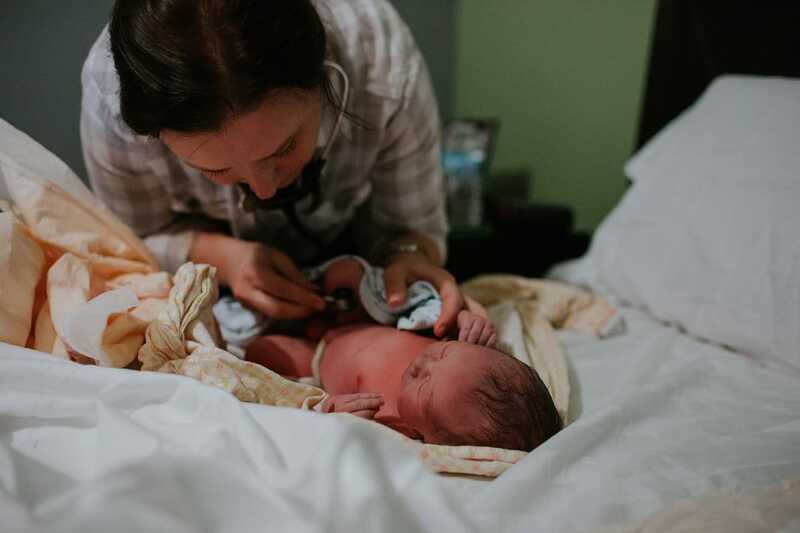 We observe the "golden hour"; This is time for the family to bond privately until it is time for the head-to-toe newborn exam (usually 60-90 minutes). Breastfeeding assistance is offered. Your placenta will remain attached to baby (and covered) during this time so that your baby has the benefit of receiving all of his/her blood supply. Your baby will be examined, mother will be fed, hydrated, helped to the restroom and cleaned up. Any cleanup of linens will be taken care of, and all questions will be answered. Once your baby is born, we will see you on days 1 and 3, week 1, week 2, and weeks 4 & 6 at home. We monitor the recovery of the mother and well-being of both mother and baby. Appointments generally last about 60 minutes. Following your last visit, we will recommend that you schedule a well-baby check-up with your family physician. ​Breastfeeding support is included. We will assist you with a postpartum plan for support from your friends and family, (meals, cleaning, errands) that will allow your family to focus on your new baby and mother's recovery. Our fees are very reasonable! Please call for more information on our fees & payment schedule options. Currently, we do not process your insurance claims for reimbursement. We do provide a contact for a insurance billing specialist in the area. We plan to do this "in house" by 2019. "Lora is a serious learner, always seeking to know, research, ask questions, observe, and try new skills. She is mature and a very hard worker. She is kind to the pregnant women and their families, and is empathetic, especially good with difficult labors or birth traumas. She was a pleasure to have around and to teach." "...Lora has a natural ability to assess patients' needs both emotional as well as physical. Even if Lora is meeting a patient for the first time, her welcoming and loving nature immediately allows the patient to feel at ease and safe. I enjoyed working with Lora and know that she will be a blessing to the women she serves in her future as a midwife."